Corps (FRSC) said in Lagos recently that it would continue to intensify efforts to clampdown on fake drivers’ licence syndicates in the country. The Surulere Unit Commander of the corps in Lagos Mr Olatunji Oguntoye, gave the assurance in an interview with newsmen in Lagos. He said: “In this locality (Surulere), Lagos we are battling with the issue of fake drivers’ licences in some quarters and this is attributed to the activities of touts in our neighbourhoods. “But we are doing all we can to see that we overcome it, hence, in our public enlightenment activities, we encourage people not to patronise fake officials. “That is what led us to transform the old licence to this one. You cannot be issued any licence now without physical capture. “If we capture your photograph, we also input your data in our system. He said the command often visited worship centres, motor parks, and also enlisted the support of traditional rulers to enlighten the public on the consequences of being in possession of a fake drivers’ licence. “To the best of my knowledge, the corps is not resting on its oars as we try to prosecute whoever is found to be in the web of producing such fake licences. “So that has been part of the protection that we are putting to ensure the authenticity of the drivers’ licence,” Oguntoye added. On the delay in the collection of driver’s licences produced by the corps, the commander said the FRSC had adopted various notification methods to ensure that the backlog of such licences were cleared without further delay. “We have gone the extra mile to inform people through both short service messages and phone calls that their licences had been produced. 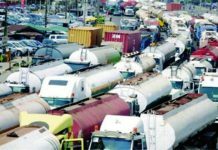 Oguntoye, however, said drivers whose licences were still being processed by the corps were required to produce a temporary licence, which is also issued by the corps, upon request. He stressed that the unit would continue to synergise with the media, to ensure that motorists and the general public adhered to road safety rules.